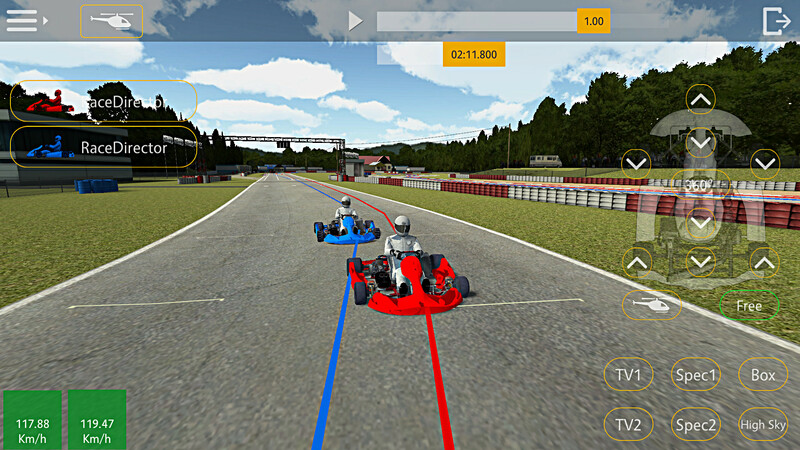 This clever multiplatform GPS data analysis application allows kart, motorcycle and motorists to analyze and virtually compare their rides on different race tracks. For all further information on the application and use please visit www.racedirector.at. The interactive comparison of your own GPS data with those of other drivers made it necessary to set up an appropriate server and database structure. The existing prototype has been further developed to ensure secure communication between the Unity client and the data server. In order to ensure a smooth presentation of the GPS data from different loggers and thus from different data formats, we have taken great care in the preparation of the data. This ensures that the data will land correctly on the track and that data of different frequencies will be displayed correctly in time. Data errors of the loggers (e.g., missing positions at the expected times) are recognized and corrected as well as possible. With Race Director GPS data can be visually compared directly on the racetrack. This can be used above all for self-optimization of one's own driving performance, by showing the own route courses in a lap comparison. Of course, the driver can also compare his laps with the data of other users. For this comparison, the two Analytics vehicles can always be populated with selected data from four data slots. It is therefore possible to load up to four different data sets - but only two are displayed. With the comparison mode a virtual race can be put together from different data. Think of your own session and, for example, the data of a professional racer. What is most likely never going to happen in real life is possible in the Race Director. But even without your own GPS data, you can virtually compete against other drivers at the Race Director. This works with a virtual vehicle that you can use to compete against the "real" drivers, trying to keep up with them on the track. If the "opponents" are too fast, you can simply manipulate the time and make all the others slower or faster or take a break completely.